3 Bedroom Semi Detached House For Sale in Burnley for Offers Over £80,000. 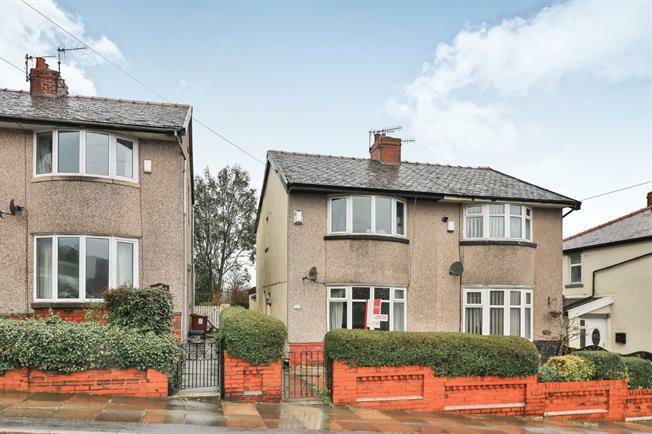 A wonderful opportunity for any first time buyers or young families, this semi detached home with extended kitchen offer excellent potential. Comprising entrance hallway, two spacious reception rooms and kitchen on the ground floor. Three bedrooms and modern shower room on the first floor, there are gardens to the front and rear. Entrance is gained at the side of the property via a uPVC double glazed door leading into the hallway. Stairs leading to the first floor and access into both reception rooms. Double glazed uPVC bay window facing the front. Radiator, dado rail, ceiling light. Double glazed uPVC bay window facing the rear overlooking the garden and double glazed uPVC window to the side. Radiator, under stair storage, ceiling light. Access into the extended kitchen. Double glazed uPVC window facing the side overlooking the garden. Tiled flooring, wall mounted boiler, spotlights. Roll edge work surface, fitted wall and base units, stainless steel sink with mixer tap and drainer, integrated electric oven, integrated gas hob, stainless steel extractor, space for washing machine. External door leading out to the garden. Loft access. Radiator, ceiling light, access to the bedrooms and bathroom. Double glazed uPVC bay window facing the front. Radiator, fitted wardrobes with sliding doors, ceiling light. Double glazed uPVC window facing the side. Ceiling light. Double glazed uPVC window with obscure glass facing the rear. Heated towel rail, laminate flooring, spotlights. Low level WC, single enclosure cubicle and thermostatic shower, pedestal sink, extractor fan. To the front is a lovely garden area with hedge surround and gated access with path leading down the side of the property. To the rear is a delightful private garden area.